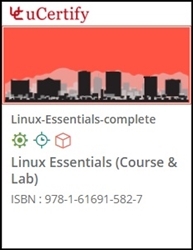 LPI Linux Essentials exam covers basic knowledge on Open Source and various distributions of Linux. Gain hands-on expertise in LPI Linux Essentials certification exam by course and performance based labs. Performance based labs simulate real-world, hardware, software & command line interface environments and can be mapped to any text-book, course & training. uCertify uses content from well known publishers and subject matter experts. uCertify brings these textbooks to life. It is full of interactive activities that keeps the learner engaged. Challenge questions are also embedded in the chapters so learners can attempt those while they are learning about that particular topic. Learners can do Flashcards, Exercises, Quizzes and Labs related to each chapter. At the end of every lesson, uCertify course guides the learners on the path they should follow.